I have had this product since mid December, so why am I just now getting around to reviewing it? One simple reason: Miss M stole it from me and has been listening to it at bedtime every night! In fact, when I borrowed it back from her she was upset, insisting that she just finished one of the CDs and needs the next one for tonight. That's gotta be a good testimonial right there! What you get is a case containing 20 CDs covering the full text of Matthew through Revelation. The recording is more than just a reading of scripture by one person; it is an audio drama in which different voices speak the different verses as if they are actually there. Sound effects enhance the production. But these big names are no big deal to me. In fact, I find that while Jim Caviezel made a pretty impressive Jesus in The Passion of the Christ, having him voice long passages such as the Sermon on the Mount quickly grows tedious. Still, overall the voice acting and production quality is quite nice. Having the Bible on audio CD is great for many reasons: little ones who can't read yet, you need to rest your eyes, your eyes are otherwise occupied (such as driving in the car), you wish to listen in a darkened room, and on and on. I myself enjoyed listening while tidying up around the house and while doing some watercolor art with the kids. 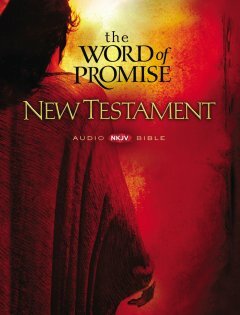 For this price (under $25), this audio New Testament is a great deal. Find it from the publisher here or on Amazon. I was given a free copy of this audio book in exchange for my honest opinion. The FTC requires that I disclose this information, but it in no way changes my expressed opinion and I wasn't required to give a good review.